Goals are great. I love goals. I’ve got a huge bucket list of goals for my life. I’ve got goals for the next three months and for the next three years. But a few years ago, I strayed away from New Year’s resolutions. I would always make these resolutions that were big and grand and never got me far. Instead, I now chose three words to keep in the top of my head throughout the year. They can be qualities I want to embody or actions I want to do more of. It’s always hard (if not impossible) to anticipate what the end of a year will look like and what my priorities will be judging from January 1. That’s the thing I love about choosing three words — there are no rules as to what they need to look like in my life. I can grow in these characteristics through whatever situations happen to pop up in my life. 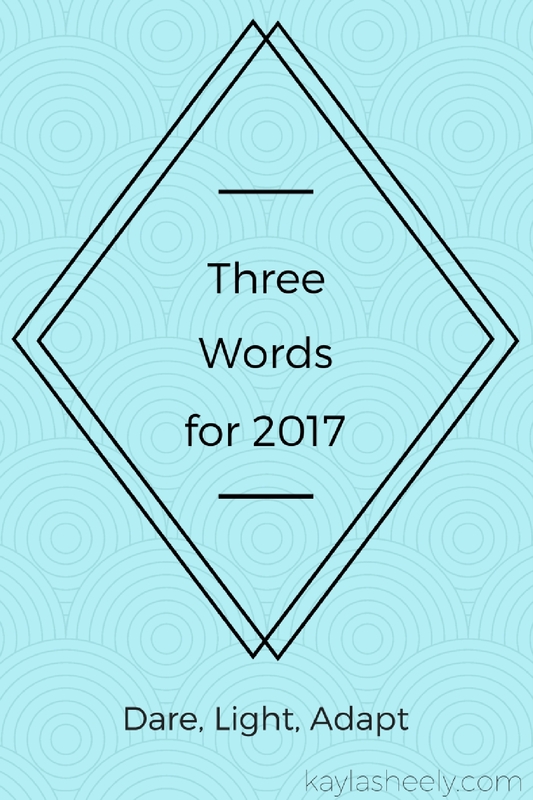 Generally, one of these three words surfaces as one with more meaning for the year than others. But they all still are impactful. They allow me to focus on who I want to become rather than what I want to do. If I am becoming the right person, the right things will follow. For 2014, I chose strength, release, and complex. For 2015, I chose love, blossom, and fearless. For 2016, I chose balance, fullness, and detachment. For 2017, I chose Dare, light, and adapt. Two years ago I made “be fearless” my personal mantra as a reminder to step outside of my comfort zone, try new things, and not let fear hold me back from living life. And the phrase has helped guide me through difficult decisions and simply overcoming little fears. This word is an extension of that. With a lot of uncertainty for 2017, I need to have the courage to do things that might be hard, uncomfortable, or maybe a little crazy. Travel was a big priority of mine in 2016 (2 countries, 5 states plus PA adventures! ), and the plan is to continue with that in 2017! One thing that has made travel easier (physically and mentally) is to travel light. Physically traveling with less things can take some getting used to (especially if you are used to packing for every possibility), but it can give you more flexibility with where you go, how much you pay, and how much time you spend figuring out what to wear each day. But traveling light is also about a mental lightness too. It’s not carrying worries, anxiety, and stress with you. It’s forgiving and letting go of any bitterness. It’s living in the moment, not stuck in the past or lost in the future. This year holds a lot of uncertainty. Potentially my whole way of life could change in ways that I haven’t even anticipated yet. It’s scary. It’s exciting. The not knowing is what makes being able to adapt and be flexible so important. It’s easy to get caught up in doing something because that’s what I’ve always done. But change is a part of life, and life becomes so much easier when you are able to accept that and move with it. What areas do you want to grow in in 2017? I’d love to hear about your intentions for the new year!